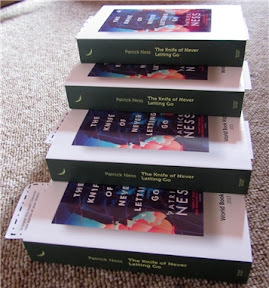 World Book Night is here at last: by the time you read this, I’ll be out and about with a box full of copies of Patrick Ness’ The Knife of Never Letting Go, which will hopefully find their way into the hands of new readers. Some of you might have noticed that one of my customary ways of expressing bookish enthusiasm is to profess a desire to stand on a street corner somewhere pressing copies of whichever book I fell in love with into the hands of random passersby. There are in fact two categories of books that are likely to make me want to do this: one is non-fiction filled with ideas I think the world needs to hear more often (oh, if only Delusions of Gender or Bad Science were to become World Book Night books! ); the other is a specific kind of favourite fiction. As a certain quote from a certain widely beloved book puts it, some favourite books you become fiercely protective of. Others, though, you want to share with the whole world – and fortunately, for me The Knife of Never Letting Go belongs to this last category. Today, then, is a bit like the fulfilment of a lifelong dream. I’ll be getting as close as I’m ever likely to get to pressing copies of a book I love into the hands of unsuspecting passersby, and hopefully I’ll be doing my bit to help spread enthusiasm about books. Also, on Sunday some of you asked to see a close-up of the “if you liked this, try…” bookmark I’m putting inside my books, so here’s a photo. There’s also a photo of The World Book Night poster I made, which includes the opening lines of the novel. I figure they would probably make people want to read on. Wish me luck, everyone! And if you’re a World Book Night giver too (or if you were one in past years), I’d love to hear about your experiences. One of these days I'm going to do this! And I couldn't be more excited about the book you picked AND the books you recommend on the bookmark! This is awesome! I hope you were successful and had a lot of fun! 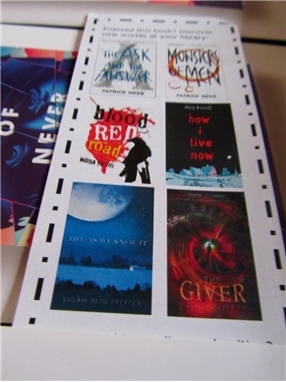 I absolutely love the idea of including "if you like..." suggestions on your bookmark. I'm handing out bookmarks, but they don't have anything like that. Too cool. I hope you had a great experience! World Book Night is so exciting! I hope you had a blast! I never manage to collect myself in time, but this always sounds like a great event. Thanks for the close-up of your bookmark! It looks fantastic. Thanks, everyone! Between giving them away personally and dropping copies off at places where they'll find their way into the hands of readers, I got rid of all of my books :D And the bookmark got some lovely comments, which was awesome. I'm leaving in an hour (5pm Chicago time) with 20 copies of Fahrenheit 451. But it's raining here! Should make things interesting. Oh Ana, YAY!!!! I would so love to do this one of these years, but I admit that the idea of it also makes me near panic attack territory. So how was it really? Was it easy once you got started? Donna, I hope it went well despite the rain! Hope it went well :) Love the idea of the bookmarks. I've never taken part, but if I did I think I'd worry about the aftermath, so to speak, and your idea would make it easier to keep reading. I did it too, and got to pass out The Language of Flowers, which is a favorite of mine too! It was so neat to think all these people will be reading one of my favorite books! Good luck, good luck! I hope everyone loves their copies of the Patrick Ness book. And man, I would love it if Delusions of Gender were given away during World Book Night. That would be amazing. This sounds like the most fabulous event! This is such a great event! How cool that you got to give out a book that you loved. 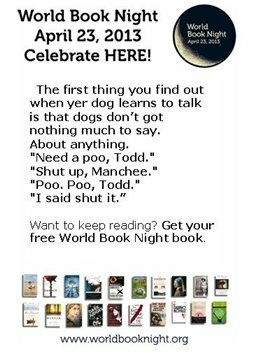 Okay, okay, ignorant noob here: What is World Book Night? I remember something called "verdens bokdag" (literally World's book day) from school, which I think was in April, but nothing about a night. That was a pretty cool day, though. We got to choose a free book from four or five different books. I loved that. Even though I don't really remember any of the books I got that way, except one. But yes, back to the question. What is World Book Night? "Noob" questions are totally allowed - we ALL start out being noobs, after all :D World Book Day exists in the UK at all, and it's more along the lines of what you described. World Book Night has only existed for three years, and it basically consists of people volunteering to give away copies of one of the books picked for that year. If you're selected to be a giver, you actually have a lot of freedom to decide what to do with your copies of the book. Currently this exists in the UK, US, Ireland and Germany, so the "world" in the name is a misnomer :P But it would be lovely to see it spread to more and more countries over time.